At the DEMO conference, Danielle Morrill, the founder and CEO of Mattermark presented an impressive statistic. Seed, Series A, Series B and Later Stage startups employ 1M people, up from 650,000 just six months ago, according to Mattermark’s data sources. While it’s logical to think that the largest and fastest growing startups might employ the majority of startup employees because they hire at stupendous rates, this isn’t the case today. Impressively, Pre Series A company employment has boomed, increasing by more than 2x in the past six months. These seed-stage companies employ 450k. 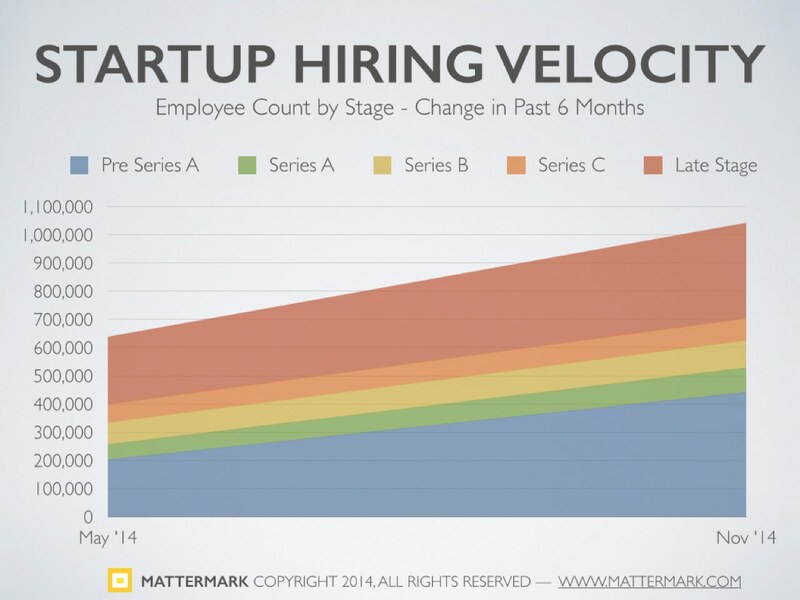 Mattermark’s employment statistics proxy the startup formation rate. The fertile fund-raising environment and the accelerating rates of new technology adoption have been enticing a substantial number of potential founders to take the leap of faith required to start a business. The doubling of employees in Pre Series A companies presages a boom in Series A financings over in the next 12-18 months and some of those companies founded today will become the behemoths of tomorrow. It also foreshadows a wave of innovation of new and wonderful soon-to-be-released products. Importantly, investors have raised nearly twice as much capital in 2014 as in 2013 and their coffers are well stocked to finance new and fast-growing companies. There’s a world of potential right around the corner, and it’s plain to see looking at employment and fundraising data. 2015 will be an exciting year for Startupland.